We can fix anything but a broken heart. I guess the term 'nobody special' comes to mind. Anyone can fix cars; it just takes time and effort. But what really makes us who we are is how we go about fixing each car and how we deal with each customer. We believe clear communication with our customers sets us apart from other shops. We really work at earning your business. 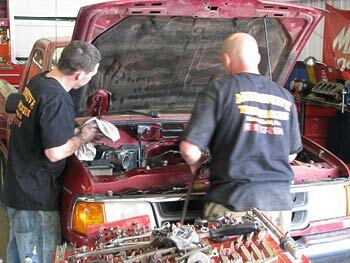 Mark Mendenhall has been fixing cars for 27 years. He has been certified by most major automotive manufacturers along with ASE. He has attended hundreds of product seminars on the latest equipment, parts updates and revisions, along with the newest techniques in diagnostics. Mark has owned an auto repair shop for 12 years now. During that time he has had a lot of help and made some good friends. These days there is a good solid team helping get the jobs done.